UNESCO information billboard, photo booth, fake UNESCO poster. 65 x 105 cm. Former UNESCO World Heritage Site, highway bridge, fake UNESCO banner. 500 x 100 cm. 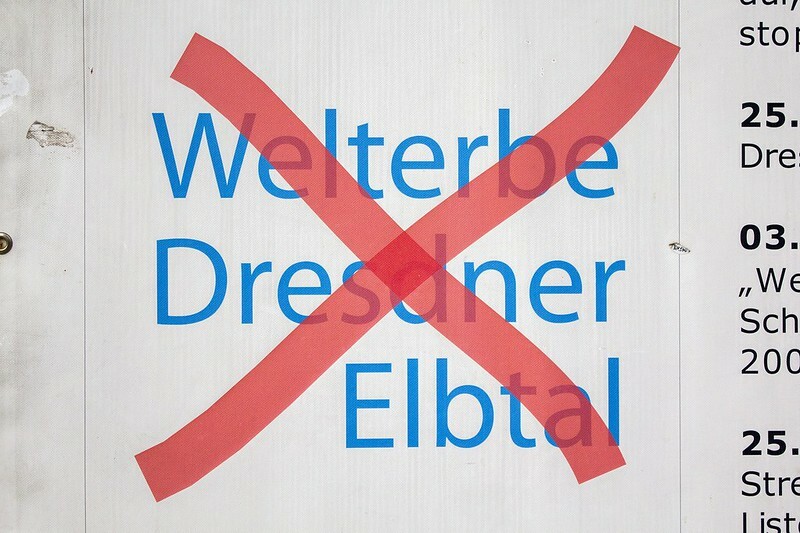 Das Graue Wunder is a two parts satirical intervention based on the controversial construction of the Waldschlösschen bridge, a highway bridge through the Elbe Valley which brought as a consequence in 2009 the unregistration of this site from UNESCO World Heritage List in which it was included since 2004. 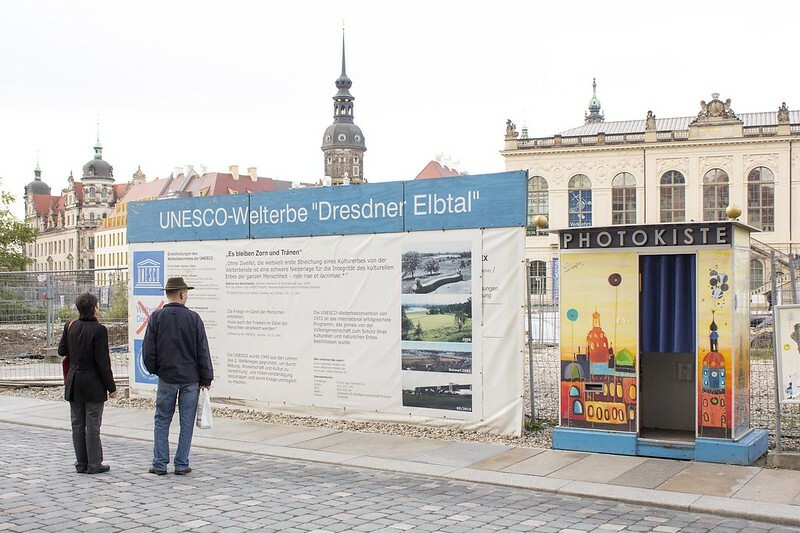 The first part of the intervention is a wallpaper pasted into a photo booth installed in Rosmaringasse, Altstadt in Dresden city center, just near the UNESCO billboard announcing the reasons why Elbe Valley was removed from the World Heritage List. 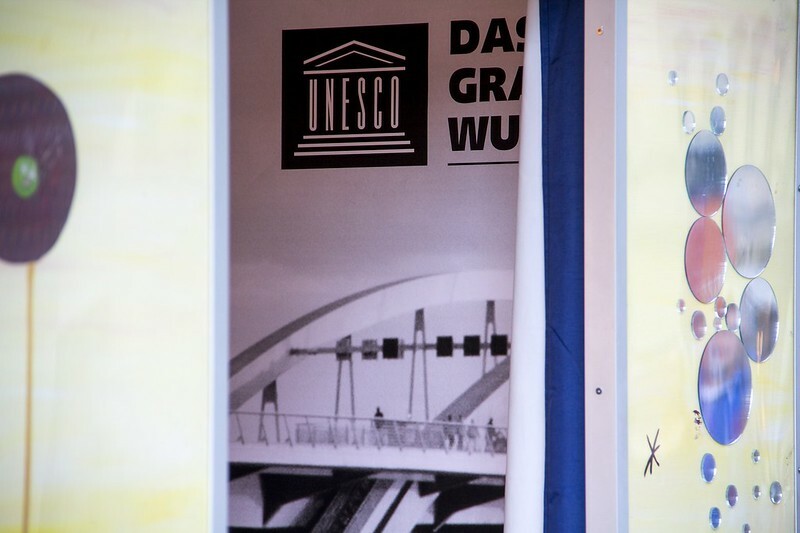 The poster shows a vertical image of the bridge and designed in a way that UNESCO logo and text « Das Graue Wunder » appears as a background of each portrait picture taken with this photo booth. 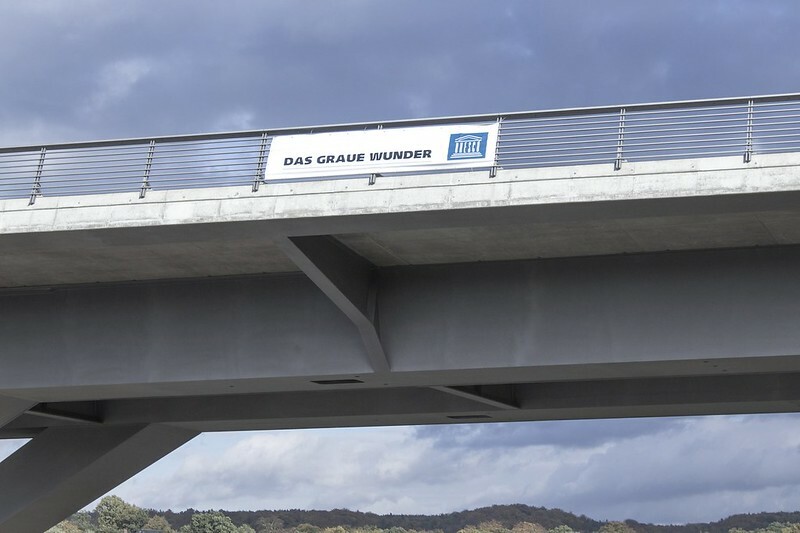 The second part of the intervention is a banner with UNESCO logo and text « Das Graue Wunder » installed at one corner of the Waldschlösschen bridge, mimetic to the six ones from Sächsische Bau GMBH company which were installed on the bridge since its building was completed at the end august 2013. 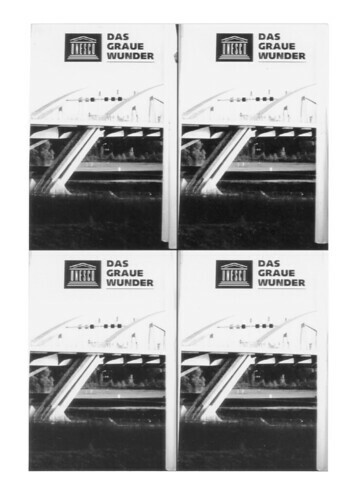 « Das Graue Wunder » is the ironic nickname given to the bridge by the citizens of Dresden who were protesting against the construction. 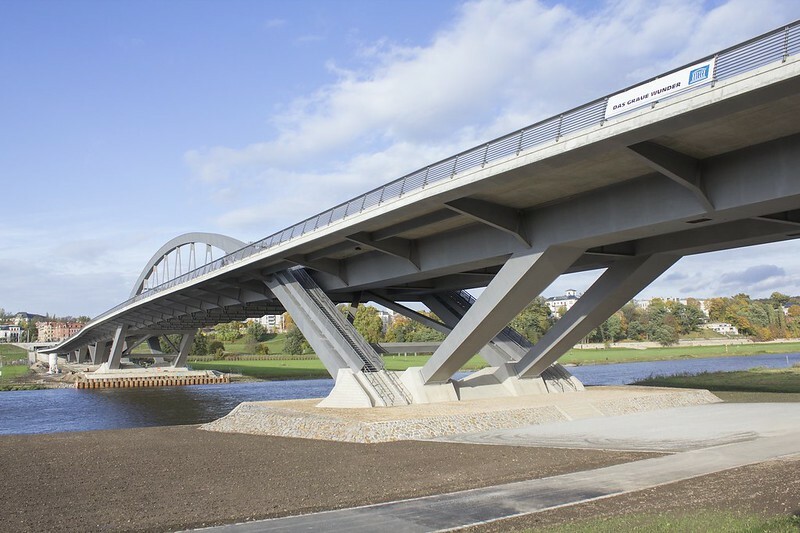 This nickname is an echo to « Das Blaues Wunder », the Loschwitzer bridge built in 1893 upstream and nicknamed in that way according an urban legend which claims that the Loschwitzer bridge was originally painted green, but that the weather turned it blue. In addition, the name is a pun, since the meaning of the phrase ein blaues Wunder erleben is « to experience an unpleasant surprise » (Wikipedia). 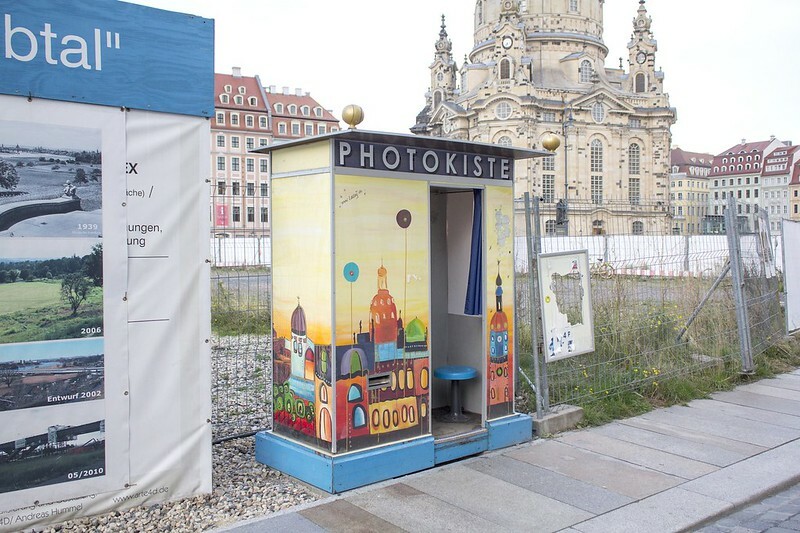 Das Graue Wunder intervention is playing with viral communication in the field of territorial marketing to highlight the disagreement of citizens within a situation where functionality overrides on cultural heritage. Concept, intervention, documentation Mathieu Tremblin, Vladimír Turner. Das Graue Wunder. Making-of. Mathieu Tremblin, Vladimír Turner. 2013. Full HD video. 3 min 33 s. Recording: Vladimír Turner. Editing: Mathieu Tremblin. Das Graue Wunder. Documentation. Mathieu Tremblin, Vladimír Turner. 2013. Digital photography. Various sizes. Photography: Mathieu Tremblin. Das Graue Wunder (self-portrait). Mathieu Tremblin, Vladimír Turner. 2013. 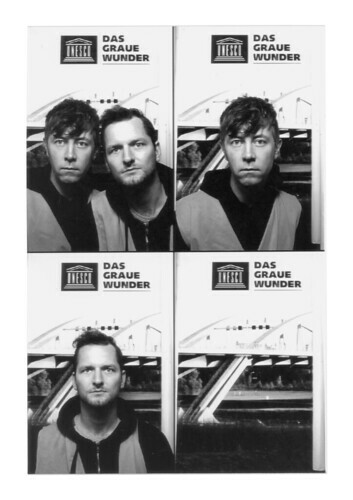 Photo booth photography. 10 x 15 cm.